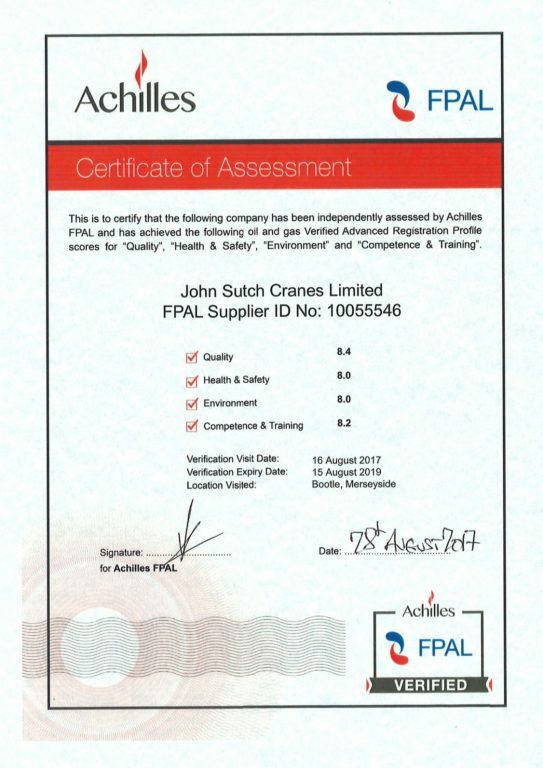 John Sutch Cranes continues to roll out its growth plans, expanding into the oil and gas sector, having become an official FPAL verified supplier. Achilles FPAL identifies, evaluates and provides pre-qualification information about suppliers on behalf of major buyers in oil and gas. Established in 1996 by the UK oil and gas industry, FPAL was formed following an industry initiative known as CRINE (Cost Reduction in the New Era) which recommended the need for improved supply chain efficiencies and development of a centralised system, helping to reduce procurement costs by 30%. The Achilles FPAL community now serves the procurement needs of the wider European oil and gas market, whilst maintaining firm roots within North Sea operations with an industry based Steering Committee of Operators, Contractors and suppliers working in collaboration to promote a fair and transparent supply chain. John Sutch, whose FPAL database number is 10055546, is able to supply Crane Hire and Contract Lifting through this important scheme. Mike Fitton, Sale Director of John Sutch explains why securing the accreditation was so important for the business: “The oil and gas sector is a major target sector for us and we want to ensure we have the necessary, relevant and highest possible standards and accreditations to demonstrate our commitment to our customers.